How to Recover Deleted Call History/Log on iPhone? 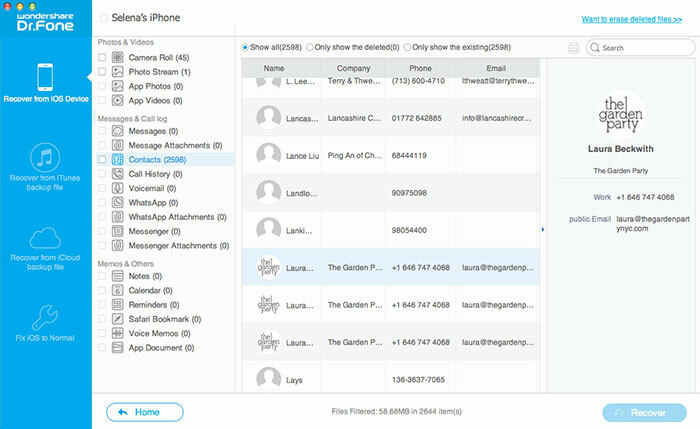 "I deleted my iPhone Call History by mistake recently, now I want to restore my deleted Call history from my iPhone on my Mac computer, can you give me some advice about how to recover my deleted call history from my iPhone? iPhone 5C, iOS 7.0.1." Every time you or anyone else makes or receives a call on an iPhone, the date, duration and contact information is recorded into your iPhone's call log. This includes both standard phone calls and FaceTime. When you accidentally deleted a call log or call history from your iPhone, don't be panic, but stop using your iPhone immediately for any activities, or the deleted call history/log will be overwritten by new data entry. Then the next important thing is to find a reliable iPhone Data Recovery tool to get your deleted iPhone call history back. There are many iPhone Data Recovery tools on the market, if you are looking for a reliable and simple to use application to get the job easily completed, you can’t miss iOS Data Recovery for Mac (get Windows version) which deliveries a pretty safe and thorough way to recover deleted call history/log in three different recovery modes: directly from your iPhone, extract from your iTunes backup or recover from iCloud backup. Deleted call logs by the program including incoming, outgoing and even missing calls. 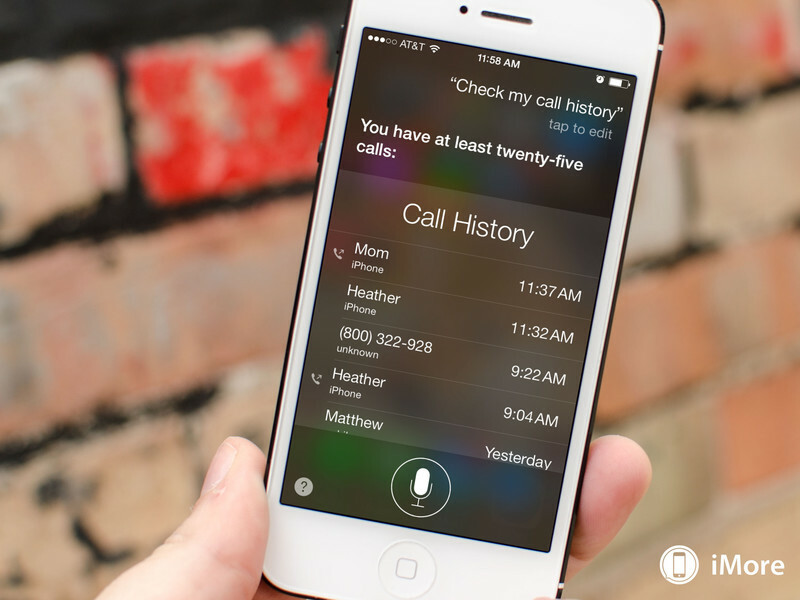 You can preview the details of your iPhone call history by phone, numbers, names, call dates, duration, etc to decide which one you want to recover. The program has full range support for all available iPhone models including iPhone 6S Plus/6S/Plus/6/5S/5C/5/4S/4/3GS. Apart from deleted call history/logs, you can also effortlessly retrieve deleted calendar, notes, whatsapp messages, voice memos, etc from iPhone. The following article will show you how to recover iPhone deleted iPhone call history on Mac directly from iPhone, from iTunes backup or from iCloud backup respectively. Part 1: Recover deleted call log directly from iPhone. Step 1: Connect your iPhone and start scanning for lost files. Connect your iPhone to the computer. Then run the program and stay at the recovery mode of "Recover from iOS Devices". When you see the window shown on the right side, you can directly click on the "Start Scan" button to begin scanning your iPhone for lost call history. Note: If you use an iPhone 4/3GS, you can switch to the "Advanced Mode" through the button at the lower-right corner. 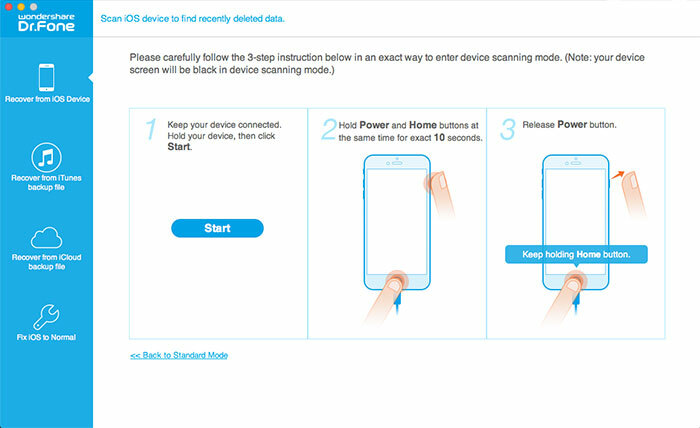 For the "Advanced Mode", you can follow the description in the window to get your iPhone 4/3GS, iPad 1 and iPod touch 4 scanned deeply. 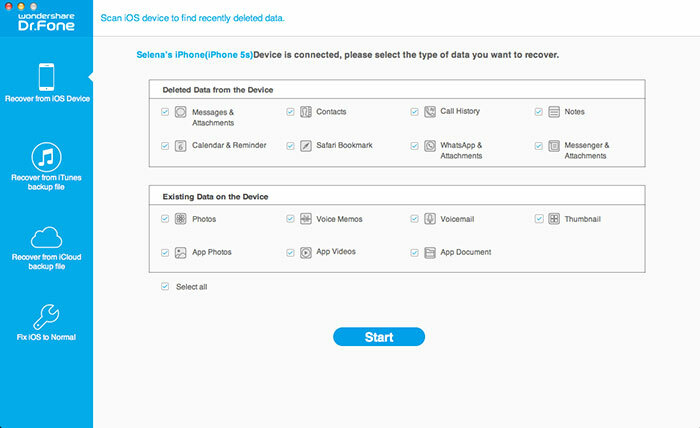 Step 2: Scan, Preview and retrieve deleted call history from iPhone. 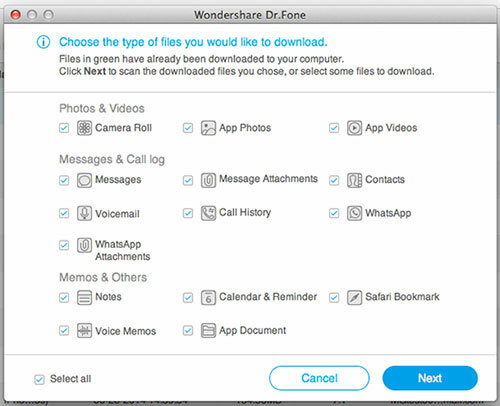 Click "Start Scan" on the window above to scan your device and find data on it, When the scan is finished, you can check all found data in the scan result generated by the program by categories listed in the left side, such as photos, contacts, messages, notes, call log, whatsApp conversations, and more. Click "Messages & Call log" > "Call History" to preview its detailed information and decide which items you want to recover. Then tick them and recover deleted call history/log to your Mac computer. Part 2: Restore deleted call history from iTunes backup file. Step 1: Extract iTunes backup file. Run the program on your Mac computer, click "Recover from iTunes Backup File" on the top of the main window, all iTunes backup files on your computer will be immediately found and displayed on the window. Choose the one for your device and click "Start Scan" to extract the content out of it. 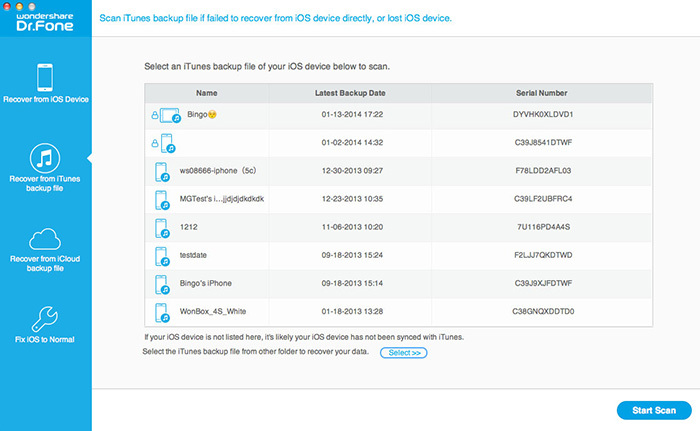 Tips: If there are more than one iTunes backup files for your device, choose the one with the latest date. 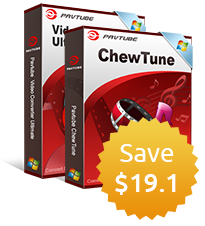 You can also extract all the iTunes backup files one by one when necessary. 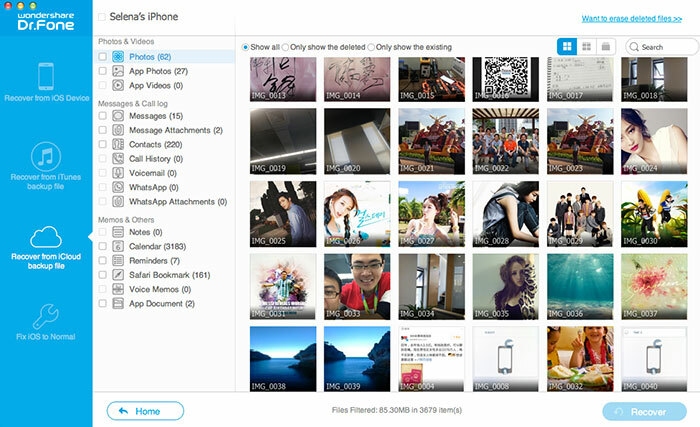 When the scan is completed, you can preview all the contents in detail by clicking the categories one after one. Mark those you want and click on the "Recover" button to save them on your Mac. Now contacts, notes and messages can be directly recovered to your iOS device if you keep your iPhone, iPad or iPod touch connected with your computer via a USB cable during the recovery process. Choose the recovery mode of "Recover from iCloud Backup File" on the top of the program's window. Then you'll be asked to log in your Apple ID. The program won't remember anything of your privacy. Just do it and don't worry. 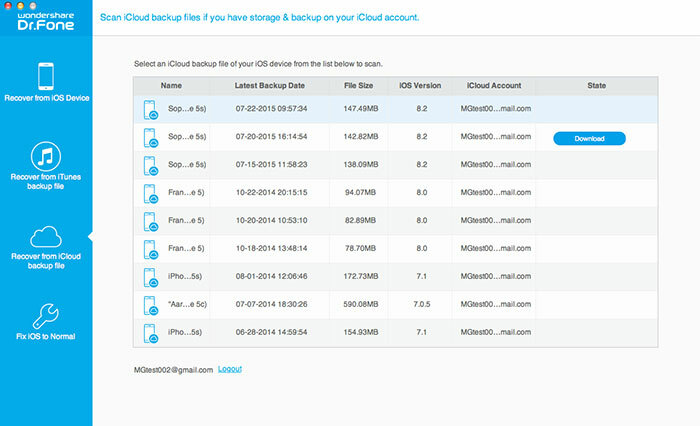 When you log in, you'll see the backup files are displayed as a list. Choose the one you need and click to download it. 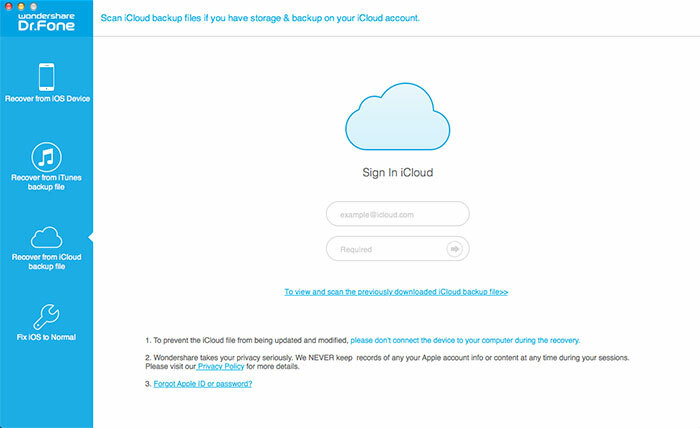 After step 1, a pop-up will appear, asking you to select file types from the iCloud backup file to download. Check the file types "Call History" to download. 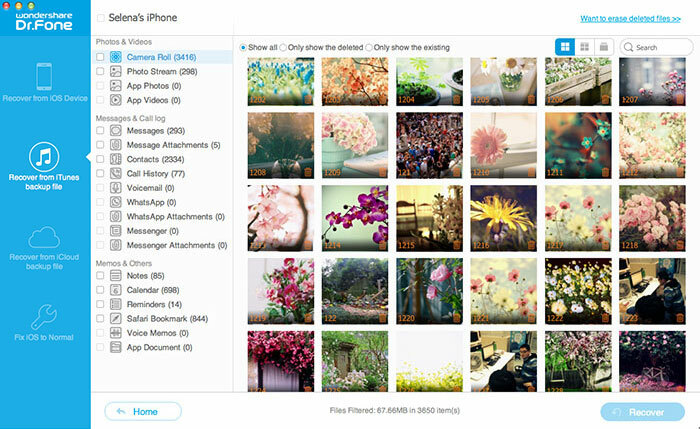 By doing this, it will take you less time to download the iCloud backup file. When the program stops scanning, you can begin previewing the data now. All found data are displayed in categories on the left side of the program. Click the call history/logs that you want to recover while previewing. At last, you can save them all on your Mac by clicking on the "Recover" button.